The 1996 Protocol represents a major change of approach to the question of how to regulate the use of the sea as a depository for waste materials in that, in essence, dumping is prohibited, except for materials on an approved list. This contrasts with the 1972 Convention which permitted dumping of wastes at sea, except for those materials on a banned list. The first Meeting under the Protocol was held from 30 October to 3 November 2006, in conjunction with the 28th Consultative Meeting of the Parties to the London Convention. One of the first key issues for discussion under the 1996 Protocol was a review of the compatibility of CO2 capture and storage in sub-seabed geological structures, as part of a suite of measures to tackle the challenge of climate change and ocean acidification. An interdisciplinary group of MIT faculty and research staff have participated in a study to assess the contribution coal can make to the growing world energy demand during a period of increasing concern about global climate change. The study looks out to the year 2050 and assesses technologies and policies we should pursue in the short-term so that we can utilize coal in the longer-term and reduce its associated CO2 emissions by at least 1 GtC. This paper summarizes the findings from three key components of the study: future coal use, coal conversion technologies, and CO2 sequestration. The full report will be available over the internet in summer of 2006. Carbon dioxide capture and storage involves the capture of carbon dioxide from a stationary source and injection into a suitable storage site. Increasing attention is being paid to the use of geologic formations as storage reservoirs for captured carbon dioxide. Property interests play a role in determining the cost of geologic storage through the acquisition of necessary geologic reservoir property rights and the value of storage through ownership of injected carbon dioxide. The determination of the ownership interest for the storage reservoir depends on whether carbon dioxide is being injected into a mineral formation, including depleted oil and gas reservoirs, unmineable coal seams, and oil reservoirs for enhanced oil recovery, in which case ownership determination is based on mineral law, or whether carbon dioxide is being into a deep saline formation, in which case the determination of property interests is influenced by water law. Acquisition of ownership rights over the formation may be done by voluntary methods, eminent domain, or adverse possession. Ownership over injected carbon dioxide will depend on whether a state subscribes to the ownership or non-ownership theory of injected gas. Liability concerning property rights may derive from several theories, including geophysical surface trespass, geophysical subsurface trespass, or liability from commingling of goods. Legislation on the state or federal level concerning property interests and eminent domain power may provide clarification over property interests and liability of geologic storage of carbon dioxide. The IEA Greenhouse Gas R&D Programme (IEA GHG) has been systematically evaluating the cost and potential for reducing emissions of greenhouse gases arising from anthropogenic activities, especially the use of fossil fuels. A mitigation technology that has been given particular attention is the capture and storage of CO2 originating from large stationary point sources. 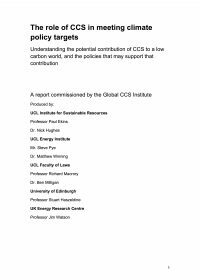 To date a series of studies have been undertaken, on a range of options for the storage of carbon dioxide. This report reviews the development of a CO2 storage cost curve for Europe. The study has been carried out by The Netherlands Geological Survey (TNO-NITG) in co-operation with the geological surveys of Britain (BGS) and Denmark and Greenland (GEUS) and ECOFYS. The IEA Greenhouse Gas R&D Programme has been systematically evaluating the cost and potential for reducing emissions of greenhouse gases arising from anthropogenic activities, especially the use of fossil fuels. To allow the different mitigation options under consideration to be compared IEA GHG has developed a series of mitigation cost curves which show the potential capacity for CO2 reduction as a function of the cost. This report reviews the development of a CO2 storage cost curve for North America, which covers on-shore USA and Canada. 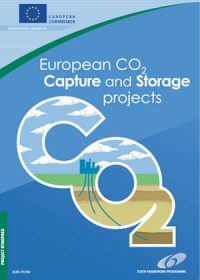 This publication provides an overview of the European Commission’s Fifth Framework carbon capture and storage (CCS) programme (1999-2002) and a snapshot of CCS projects funded under the Sixth Programme (2002-2006).